In 2001, the year before my little one was born, a Judge already wrote these wise words. They are as true today as they were 13 years ago. Children should not be brought into their adult rock-heads’ fights. All I know, is that it hurts me to see my little one hurt. Posted on February 6th, 2014 under Children's Rights, Family. 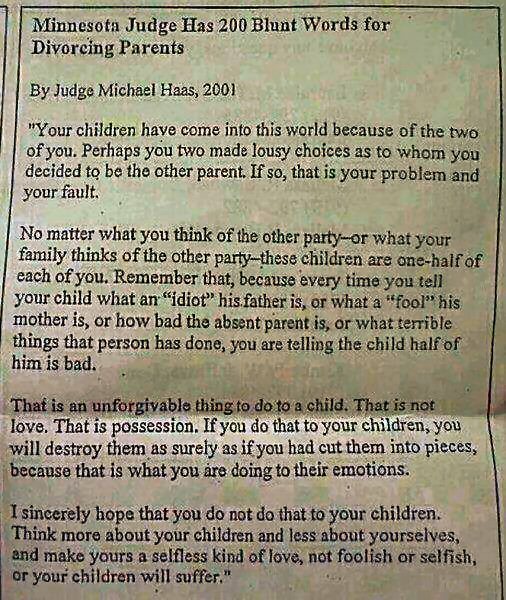 Tags: Divorce, Parenting. RSS 2.0 feed. Both comments and pings are currently closed.